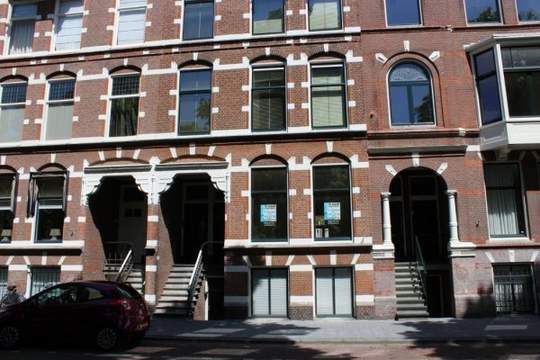 In a quiet street in the Renbaankwartier lovely well maintained two room apartment with balcony. The apartment is close to the boulevard, the beach of Scheveningen and in the vicinity of shops and public. Also 5 minutes by bike from the Statenkwartier area where the International zone is located, namely Europol, Eurojust, OPCW and several organizations. Within walking distance of the French school and supermarket. Layout: open porch, stairs to the apartment on the first floor, private entrance, stairs to the second floor that opens into the corridor, from the corridor you enter the living room at the front with large window so thats makes it a very bright apartment and semi open kitchen with various built-in appliances and built-in shelves on the otters side of the kitchen, at the rear there is the spacious bedroom with built in cupboards and doors that open to the balcony (west) over the full width where you can enjoy the sunset after work with a glass of wine. So a very nice apartment! - Located at a top location near shops and public transport.